A photographer attempting to snap photos of Justin Bieber’s white Ferrari 458 Italia was hit by another car and killed last night, according to TMZ. The celebrity news site indicates that California Highway Patrol pulled Bieber’s Ferrari over Tuesday evening for a routine traffic stop on Sepulveda Blvd. in Los Angeles. During the traffic stop, the pursuing paparazzo decided to get out his vehicle to photograph Bieber and his vehicle. The photographer reportedly ignored police warnings to move way from the scene, and was then hit by an oncoming vehicle and killed. TMZ reports that Bieber was not in the vehicle at the time of the incident. 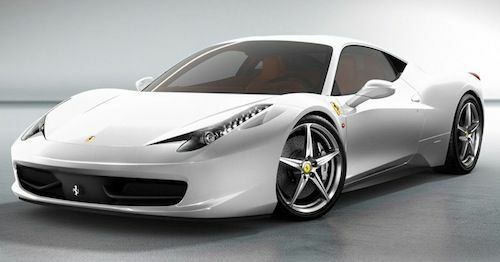 It is unclear who was driving the white Ferrari, although the driver is believed to be the pop star’s friend. Sources also point out that another friend was in the passenger seat. Drugs and alcohol do not appear to be a factor for the driver of the vehicle that hit the photographer. The LAPD is currently investigating the incident. This is the second time a paparazzi-related accident has occurred while in pursuit of Bieber. In September, two photographers crashed into each other while attempting to snap pictures of Bieber’s chrome Fisker Karma plug-in car. Like Tuesday night’s incident, the September accident also involved a traffic stop. There were no injuries reported in the fall occurrence, but one vehicle reportedly jumped up onto the curb after striking another photographer’s car. Tuesday’s tragic accident is not the first time Bieber has lended his personal vehicle to a friend. In September, it was reported that the “Baby” singer had gifted his $100,000 Fisker Karma to friend and fellow pop star Sean Kingston. It later turned out that Bieber had just loaned his luxury plug-in to Kingston. The “Believe” singer has been a magnet for photographers and law enforcement officials alike since obtaining his driver’s license. Aside from the aforementioned incidents, Bieber recently received a ticket for making an illegal left hand turn while driving his Ferrari 458 Italia in West Hollywood. The singer was also ticket for having an expired registration in the November traffic stop. In July, Bieber was nabbed for speeding in his customized Fisker Karma while driving on the 101 Freeway. In addition to his Ferrari Italia and Fisker Karma, Bieber also owns a custom Cadillac CTS-V coupe. Known as the “Bat-illac,” Bieber’s modified ride features a blacked-out paint job, black wheels and a Batman logo on the car’s front grille. The pop star’s garage also includes a Range Rover, a red and black Ducati motorbike, and a Lamborghini Gallardo, which P. Diddy gave him for his 16th birthday. I am really sorry for the Paparazzo. This is very tragic and no picture is worthy of a human life. We have become so celebrity-obsessed and this is what happens as a result. So sad.